PNNL battery expert, Jun Liu, took on the role of ICESI chairman during the inaugural meeting in China in Jan. 2018, with the goal of connecting the international battery research community. DALIAN, China — Energy storage allows power operators across the nation to balance electricity supply and demand instantaneously, affording ratepayers a more resilient power supply. Now the focus on energy storage is global. In January, energy storage experts at the Department of Energy's Pacific Northwest National Laboratory joined forces with their counterparts around the world to forge the International Coalition for Energy Storage and Innovation, or ICESI. Nearly 300 energy storage leaders from several nations — among them, the United States, China, Spain, Germany, Italy, Japan, and Korea — came together in Dalian, China on January 17 to formalize the coalition's role. The event was hosted by the Dalian Institute of Chemical Physics. ICESI connects the international research community with industry to address long-term challenges for developing and deploying energy storage technologies for the power grid. Leading the charge was PNNL's Jun Liu, internationally recognized energy storage expert who took on the role of ICESI meeting chair, overseeing nearly 100 keynote, invited, and oral presentations. "Participants at the meeting included experts from all over the world in industry and academia," said Liu. A sampling of those who attended included Spain's Teofilo Rojo, who pioneered sodium-ion battery research several years before the topic became "mainstream;" Khalil Amine of the U.S.'s Argonne National Laboratory, the most cited scientist in the world in the field of battery technology from 1998-2008; and China's Huamin Zhang from the Dalian Institute of Chemical Physics, a leading institution in the field of vanadium redox flow batteries which is currently involved in the manufacturing of the largest flow battery. PNNL's wealth of energy storage expertise helped lead to the formation of ICESI. According to Greentech Media, the energy storage market is zooming towards $3 billion by 2022, a tenfold increase from 2016. And, it's so important to the nation's power supply that DOE's Energy Storage Program has funded PNNL since 2008 to advance the state of the art in battery technology for the electric grid. PNNL has developed specialized tools that are used to develop and test next-generation battery systems at its Richland, Wash. campus. There is also the stable of bright minds who've successfully transferred the energy storage technologies they've developed to the marketplace, such as the advanced vanadium redox-flow battery technology licensed to Mukilteo, Wash.-based UniEnergy Technologies, LLC. 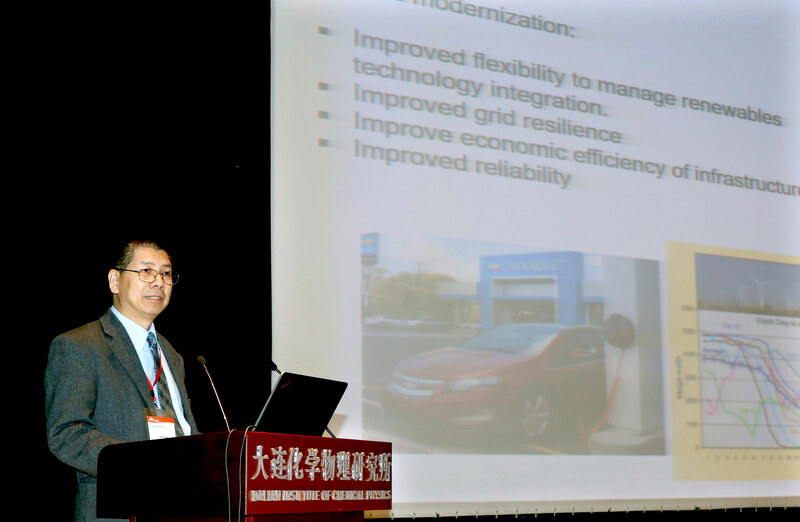 Wei Wang, a senior scientist who heads stationary energy storage research and development at PNNL, served as the ICESI meeting general secretary and gave an invited talk. PNNL's Jud Virden, the head of the Lab's energy and environment research, was a keynote speaker who discussed results from grid energy storage systems in the field. PNNL energy storage leader Vincent Sprenkle was a member of the ICESI organizing committee and spoke about standards for advancing energy storage technologies. "As part of a scientific force that focuses on development of important energy storage solutions for industry, we understand that the need for such technologies goes beyond U.S. borders," said PNNL's Wang. "We knew an organization like ICESI is critical to bring the minds of the international energy storage community together to solve challenges impacting many countries." Organizers also honored several innovators who have made key scientific impacts or shown strong leadership in the field, including Dr. Imre Gyuk, director of DOE's Energy Storage Program, who gave a keynote address at the meeting and received an award for his exceptional leadership. The meeting also sponsored a young scientist forum and handed out two Young Career Awards. PNNL and its collaborators are beginning preparations for the second annual ICESI meeting, which will take place in early 2019.